Holi, is a spring religious festival celebrated in India by Hindus and Sikhs. In West Bengal and Orissa of India it is known as Dolyatra (Doul Jatra) or Basanta-Utsav . The most celebrated Holi in India is that of the Braj region, as it is associated with Lord Krishna: these sacred places are Mathura, Vrindavan,Nandagaon, and Varanasi. The main festival of Holi, also known as Dhuli Vandana in Sanskrit, or Dhulheti, Dhulandi or Dhulendi, is celebrated by people applying coloured powder and throwing coloured water at each other. Bonfires are lit the day before, also known as Holika Dahan the burning of Holika or Chhoti Holi Bonfires are lit in memory of the miraculous escape of the young devotee Prahlad accomplished when Demoness Holika, sister of Hiranyakashipu, carried him into the fire. Holika was burnt but Prahlad, a staunch devotee of god Vishnu, escaped unhurt due to his unshakable devotion in the Almighty. Amongst India's innumerable festivals, Holi ranks as the most colourful. It celebrates the arrival of spring and death of demoness Holika, it is a celebration of joy and hope. Holi provides a refreshing respite from the mundane norms as people from all walks of life enjoy themselves. In a tight knit community, it also provided a good excuse for letting off some steam and settling old scores, without causing physical injury. 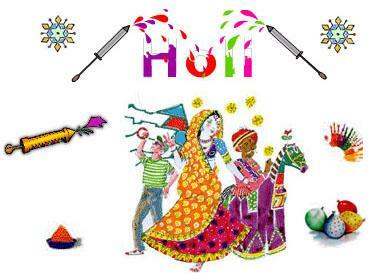 Holi continues to be celebrated with great vigour through out India. Countless Hindi films have brought the vibrant colours of the festival to the screen. Indians all over the world eagerly await the Festival of Colours, as bonfires are lit to banish the cold dark nights of winter and usher in warmer spring. Dhuleti, day after Holi, is the actual festival of colours, when everything in sight is covered in a riot of colours. Twin towns of Nandagow ( where Lord Krishna grew up ) and Barsana ( where Shri Radha grew up ), near Mathura, are the epicentre of the celebrations. Lord Krishna, while growing up in Vraj, popularised the festival with his ingenious pranks. Gopies of Vraj responded with equal enthusiasm and the festivities have continued ever since. Role reversal, feminism etc. are accepted customs for the duration of the festival! Men and women of Vraj clash in a colourful display of battle of the sexes. Celebrations start a week earlier than rest of India. Men of Nandagow raid Barsana with hopes of raising their flag over Shri Radhikaji's temple. They receive a thunderous welcome as the women of Barsana greet them with long wooden sticks. The men are soundly beaten as they attempt to rush through town to reach the relative safety of Shri Radhikaji's temple. Men are well padded as they are not allowed to retaliate. In this mock battle the men try their best not to be captured. Unlucky captives can be forcefully lead away, thrashed and dressed in female attire before being made to dance!! Rush through Barsana is far more lethal than running with the bulls in Spain, at least you don't have to marry them one day! Famous poets like Surdas, Nand-das, Kumbhan-das and others, have written beautifully as to how Lord Krishna was similarly received and forced to wear a sari, forced to wear make-up and made to dance before being released by the gopies of Vraj.